Headworks Dam Site of the Trishuli 3A Hydropower Project (60 MW) – Salleta, Rasuwa District. This photo was taken in October 2013, when I revisited the first hydropower project I encountered in Nepal (during November of 2012). The project had evolved significantly in the time between visits, as had local opinions concerning the project. 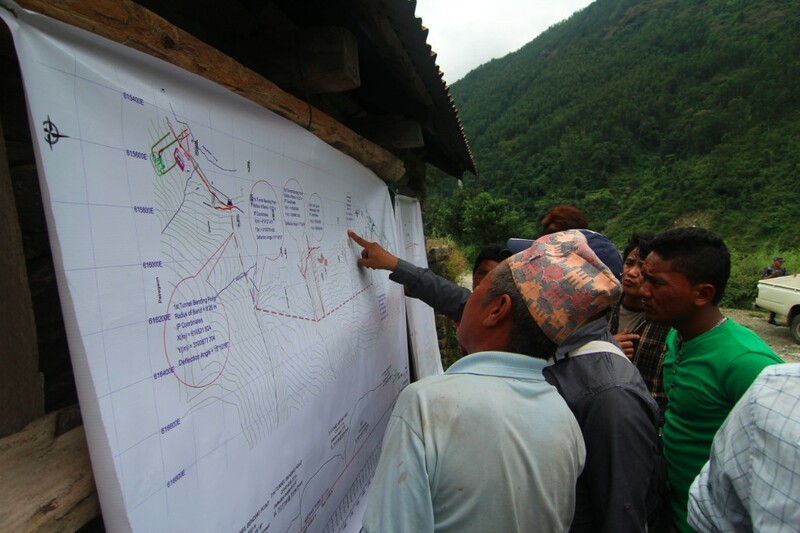 Over the course of this year, the Trishuli 3A project had been engaged in controversy from multiple directions – firstly, on the national scale when the Chinese contractor CGGC became involved in a political and legal battle with the government surrounding the scale and timeline of the project; and secondly, on the watershed scale as locals have protested against the project, citing broken promises and damages incurred from a series of landslides triggered by blasting of the headrace tunnel. Currently, there are two more hydropower projects being constructed at a confluence just 2km above this site and another slated be built just below in the coming years. Overall there are roughly 14 projects in different phases of planning and construction on the Trishuli River alone, representing over 838 MW of generation capacity – to put this in perspective, this is more than the current total power generation capacity for all of Nepal (705 MW) and this is just one river. During the dry winter months the unfulfilled promise of 83,000 MW of total generation potential hangs over Kathmandu like a cloud, while rolling blackouts consume the growing city of roughly three million for up to eighteen hours per day. The ‘need’ for hydropower exists large in the social imagination and as a central topic in political and developmental discourse, especially now as Nepal emerges from the 2013 Constituent Assembly elections – the latest stage in a complex and ongoing process of political and democratic transition. 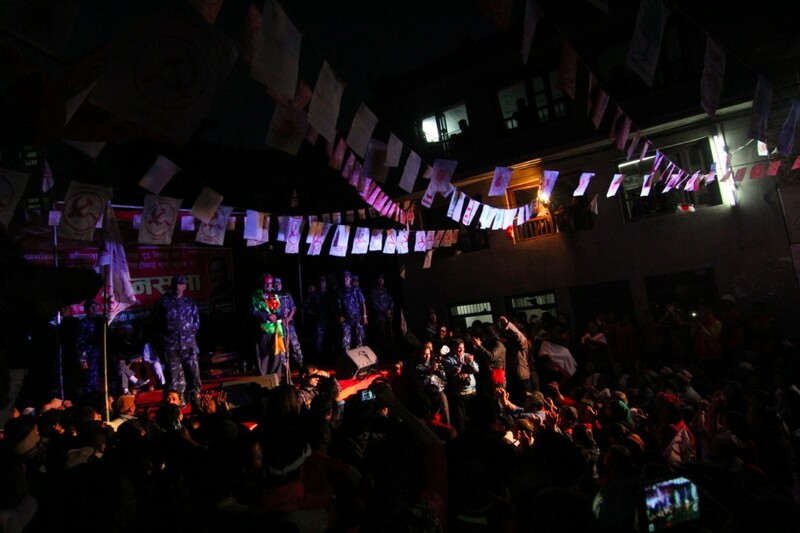 In this photo, Maoist-UCPN leader Prachanda gives his final 2013 campaign speech in Kirtipur (Kathmandu-10) constituency, making promises about providing electricity - halfway through this speech, the lights went out. Public Hearing for the 37 MW Trishuli 3B Hydropower Project (37 MW) – Pahirebesi, Nuwakot District. Local men peruse the public plans on display at the official public hearing, organized by the Nepal Electricity Authority as per the stakeholder engagement process. 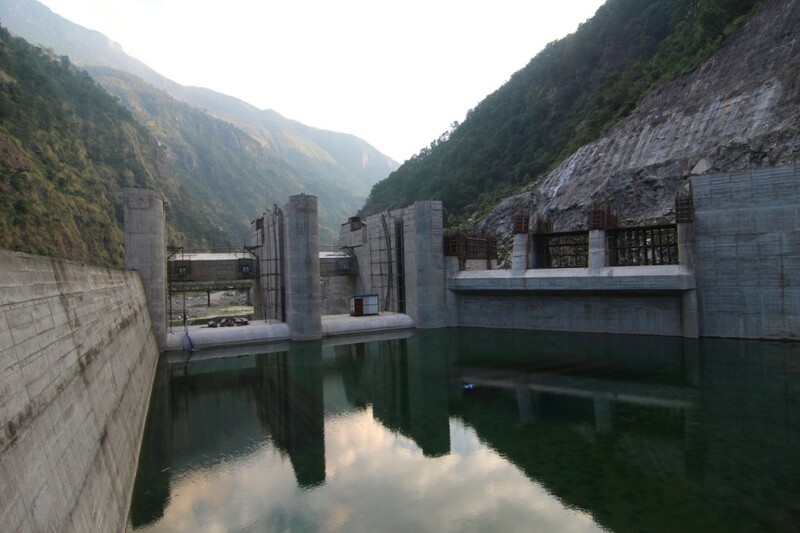 This project will soon be built on the heels of the Trishuli 3A Project, re-channeling and re-using return flow from the tunnel above, moving water through a new tunnel. Due to local dissatisfaction with the 3A Project and complaints concerning representation of the needs of ‘project-affected persons’, a group of local stakeholders boycotted this meeting, successfully drawing most of the 400 people in attendance away from the public hearing. This photo was taken almost a mile underground, in the main powerhouse tunnel of the Upper Tamakoshi Hydropower Project, the largest currently being built in Nepal. This cavern will house six massive turbines connected to a complex system of tunnels being excavated simultaneously, to connect the ‘peaking reservoir’ near the village of Lamabagar – nearly 14km and 800m above. The tunneling project is being undertaken by the Chinese contractor SinoHydro and currently, civil construction works are roughly 60% complete. Work on the tunnel system proceeds 24 hours per day, with over 400 laborers and engineers working in shifts. The temperature inside the cavern was 32 degrees Celsius when this photo was taken, just after midnight. 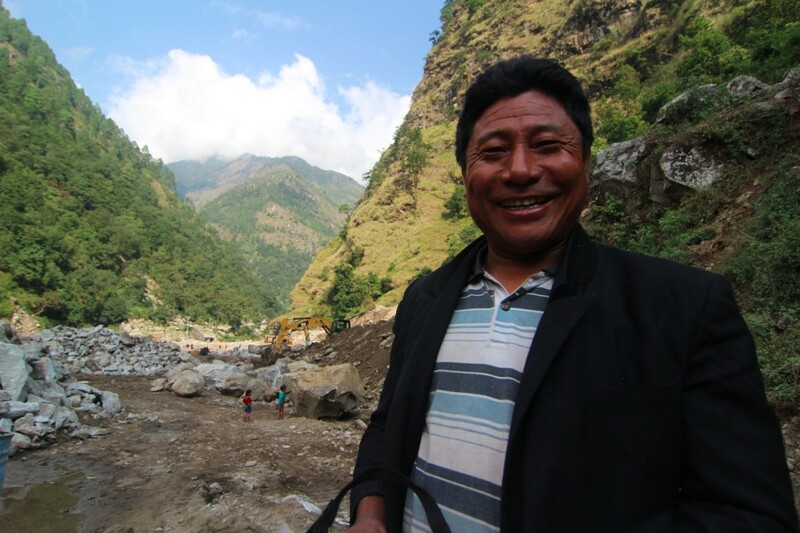 This man and the settlement where he lives are both within the 'inundated area' of the pending Tamakoshi III Hydropower Project (650MW) – an ‘export project’ which will sell nearly all power generated to India. This project is being pursued by SN Power, a Norwegian contractor which previously completed the nearby Khimti Project (60 MW) considered an example of ‘best practices’ in terms of social and environmental mitigation. This mega-project is a ‘peaking reservoir’ project which will submerge an estimate 88 homes, requiring the relocation and resettlement of roughly 400 people. Environmental impact assessments, formal public hearings, and informal compensation negotiations have all been conducted – local people are largely compliant, yet the project has been help up due to political instability. 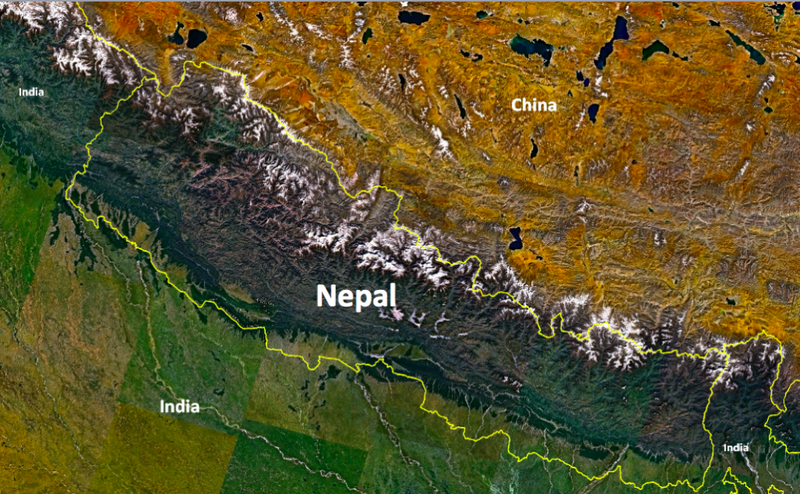 The evacuation of power to India requires transmission lines connecting Nepal to the South Asian grid that have yet to be fully approved. 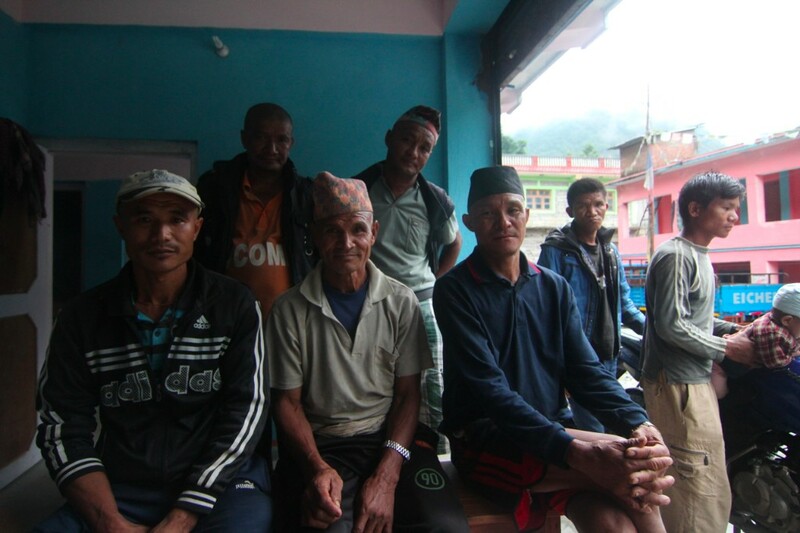 These men participated in a five day strike in May of 2013, during which they blockaded the access road for the Trishuli 3A Hydropower Project. The strike was formed in response to a range of local dissatisfactions concerning the project, including ongoing problems with regard to compensation for damages incurred by landslides resulting from tunnel blasting. The strike effectively stalled construction for a period of five days - incurring significant costs and delays to the Chinese contractor CGGC, making national media - after which armed police forces were deployed to negotiate. All of these men are from the Tamang settlement of Simle, which is directly above the powerhouse and return flow tunnel system for the Trishuli 3A Hydropower project. The majority of Simle’s agricultural lands were acquired during construction, so persistent concerns of food insecurity in the village are even more aggravated. Headworks Dam Site of the Upper Tamakoshi Hydropower Project (456 MW) – Lamabagar, Dolakha District. The Upper Tamakoshi Hydropower Project is the largest in Nepal – at 456 MW, it will be over 3x larger than the 144 MW Kali Gandaki A project, that was completed in 2000. This photo is taken from just about the headworks construction site, where the a dam is being constructed to divert the river’s flow through a 14km tunnel through the mountainside, and then 800m down to the powerhouse below. The UTKHP is a ‘peaking run-of-the-river’ project – a design which creates temporary impoundments of water (like a reservoir dam) so as to guarantee maximum water supply and generation during time of peak demand. In this design, the reservoir is not permanent, but the inundated area is uninhabitable – in this case the dam site is above the settlement of Lamabagar, so there are no homes in the inundated area. This dam is built very close to the border of Tibet, when I took this photo I was walking down from Lapche, a remote and roadless area of Nepal further up the canyon. Once the UTKHP is completed, the road will continue upriver to facilitate two planned hydropower projects, eventually connecting overland to the Tibetan Autonomous Republic (China). This photo was taken directly at the border of Tibet, near the settlement of Lapche in the high reaches of Dolakha – currently a restricted area. 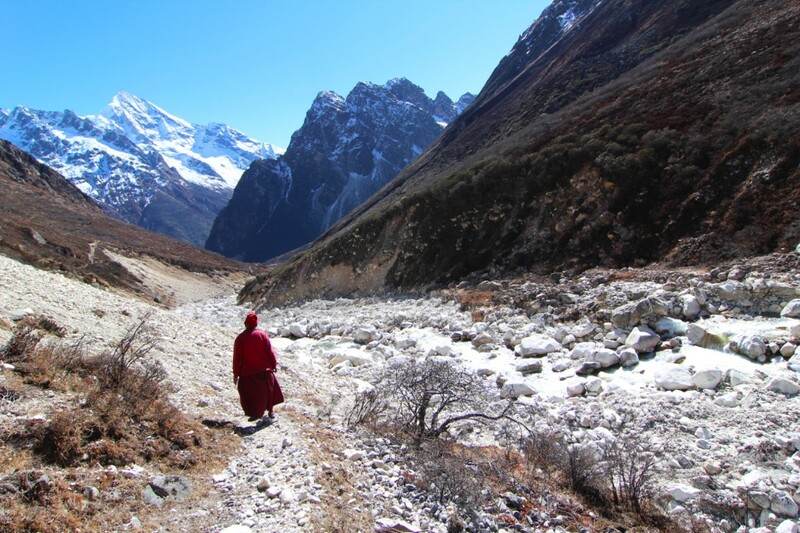 The head lama of the local monastery walks along the Lapche Khola, which flows from Tibet. In the coming years there are two hydropower projects representing a total of over 300 MW scheduled to be built along the Lapche Khola, which has a very steep gradient and therefore high generation potential. To support these projects and future trade, the new road to Lamabagar (built to facilitate the construction of the 456 MW Upper Tamakoshi Project) will be extended into this region – creating a new overland route connecting Nepal to the Tibetan Autonomous Region (China). Over the border, powerlines and a road have already been built by China in anticipation of this connection. These men are migrants from other parts of Nepal who have arrived at the hydropower frontier in the hopes of finding work. 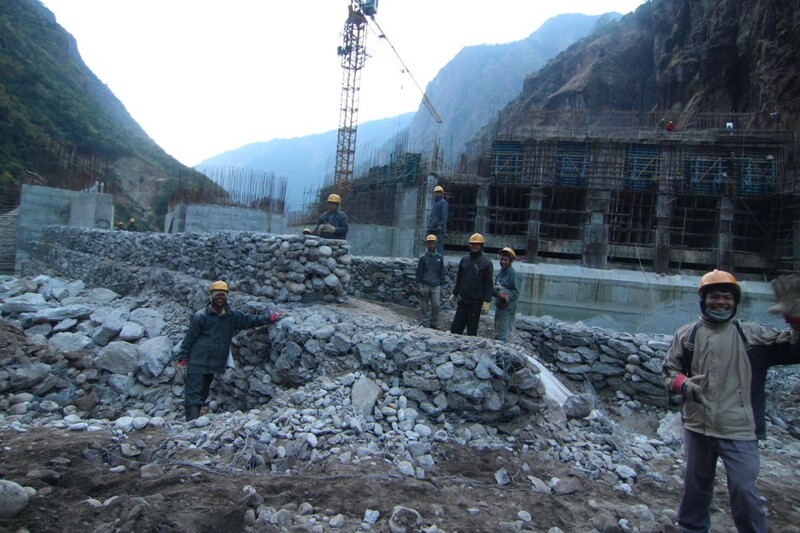 This photo was taken just outside the offices of SinoHydro, the Chinese contractor completing the civil engineering works for the Upper Tamakoshi Hydropower Project. These men are holding their hiring paperwork in their hands, and wearing their newly issued safety gear. Work at the project site is intensive and often hazardous, especially within the tunnel system – though the UTKHP does have a good safety track record, which is monitored by a Norwegian engineering consultancy NorConsult. Employees generally work in 11 hour shifts, rotating to ensure 24 hour construction. For this project (perhaps due to government and third party oversight) the pay is considered good for the area, and hundreds of people have come into the area from outside – some are daily or task-specific wage labor, and some work on monthly contracts. 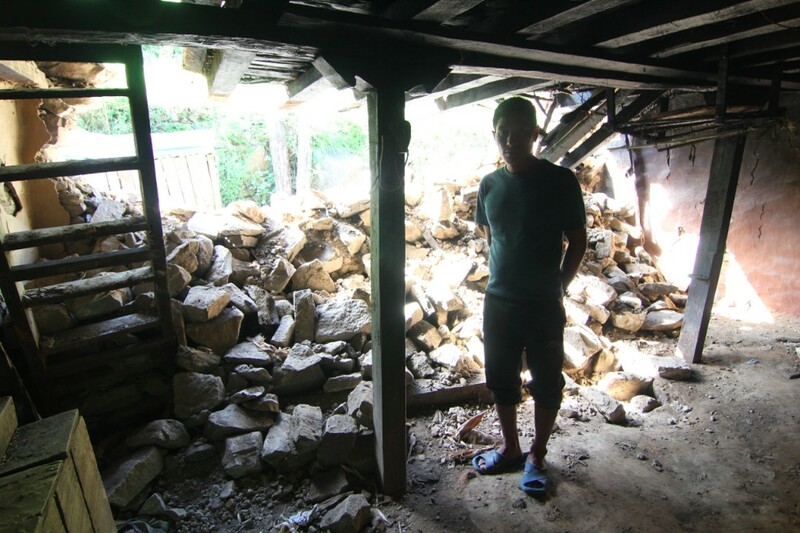 This man’s house collapsed during blasting for the intake tunnel of the Trishuli 3A Hydropower Project, immediately below this village. Several landslides have occurred in the area, which have damaged both local property and project infrastructure. Locals have requested the attention of the Chinese contractor CGGC, pointing to cracks forming in their houses and citing future risks of subsidence on the steep slope. Compensation has come to locals in some cases, and not in others – this man has been compensated, but has not yet been able to rebuild a new house with the money provided. He is living with extended family on the other side of the village, away from the more unstable area. 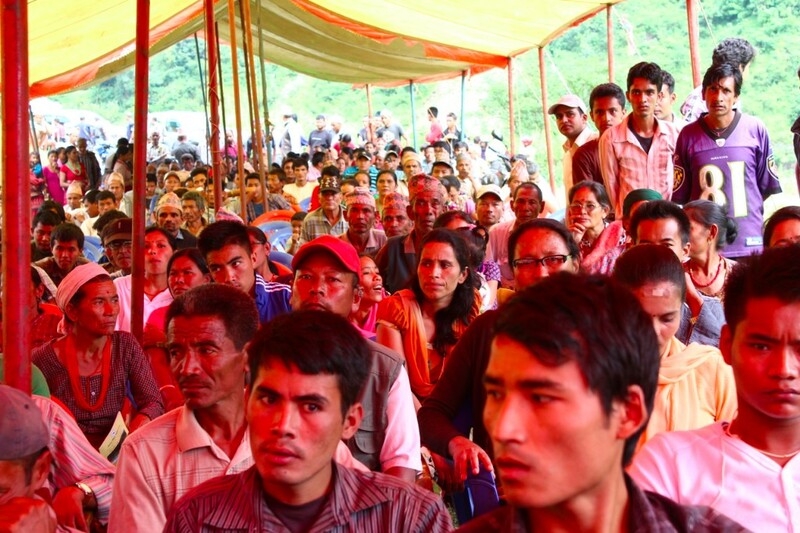 People from ‘project-affected communities’ listen to speeches given by political actors, project concern committee members, and local leaders of a bahiskar[boycott] movement protesting the committee at the public hearing for the Trishuli 3B Hydropower Project (37MW). This meeting began with speeches and an organized program, but following speeches by local leaders it quickly deteriorated into a shouting match between ‘affected parties’ / stakeholders with different views. Due to negative experiences with the developer of the Trishuli 3A Project – Chinese contractor CGGC – local concern committees are attempting to be proactive in demanding their rights, and in producing a written list of demands – the boycott was organized due to the failure of the meeting organizers to distribute or include the agreed upon list of demands in the Environmental Impact Assessment (EIA) for the meeting. There is a great deal of uncertainty as to where exactly the tunnel might go, and how households above might be affected – and based on landslides and subsidence triggered by tunnel blasting for the Trishuli 3A project just upstream, locals are concerned about property damage. The boycott was eventually successful - most of the 400 people in attendance walked away from the public hearing, and the project managers left without presenting their program. The media reported, however, that the public hearing went well. 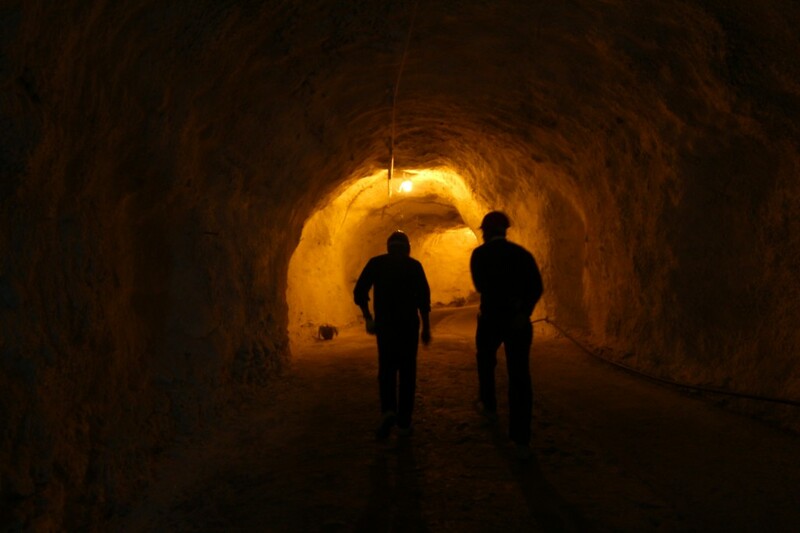 The powerhouse of the Upper Tamakoshi Project is located nearly a mile underground, and there are roughly 80 people working in the main cavern at any point in time – blasting, running excavation machinery, constructing the armature of the powerhouse, pouring concrete forms, and laying cable and conduit for the electrical infrastructure. 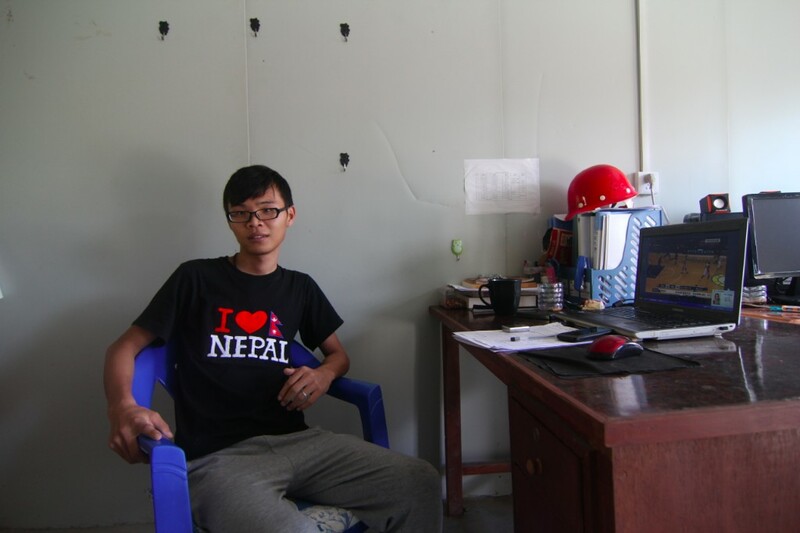 Chinese and Nepali employees work in rotating 12 hour shifts, attempting to keep the project on timeline (a politically important issue in Kathmandu). Working conditions are difficult in the tunnels, as ventilation problems can lead to exhaustion, yet there is a good safety record overall. Shortly after this photo was taken, the power failed and all the lights went out for about ten minutes. This man lives in Mailung – previously a settlement of just eight Tamang households at the end of a very simple road, now the site of three different hydropower projects. The road was first built to support the Mailung Khola Hydropower Project, a small Nepal-owned 6 MW venture (just completed); then widened to support the construction of the 60 MW Trishuli 3A Project by Chinese contractor CGGC; now being extended to support the construction of the 216 MW Upper Trishuli 1 Project, being built by a consortium of Korean contractors. Mailung is now a boomtown, with over 800 people living and working in the area, and this man has been hired as a ‘local labor manager.’ He is happy with the compensation he has received and his job, but he is unsure about what the future will look like here. Gendered exclusion is a major issue across Nepal – which reproduces itself in terms of hydropower development, driving problematic trends within the process of stakeholder engagement. Women are often lack information about hydropower projects, and women are always under-represented at project-related meetings – they are told not to go, not able to go (due to domestic or subsistence workloads), or do not feel comfortable going to meetings. Ethnic, caste, and class divisions and exclusions often worsen the situation. Further, massive trends of outmigration have increased the pressures that keep women at home, leading to widely recognized patterns of the ‘feminization of labor’ and the intensification of household work, in the absence of male family members. Social mitigation and stakeholder engagement needs to make a greater effort to engage women in the process, to account for their views and promote their voice in decision making in a substantive way – yet this is rarely the case. 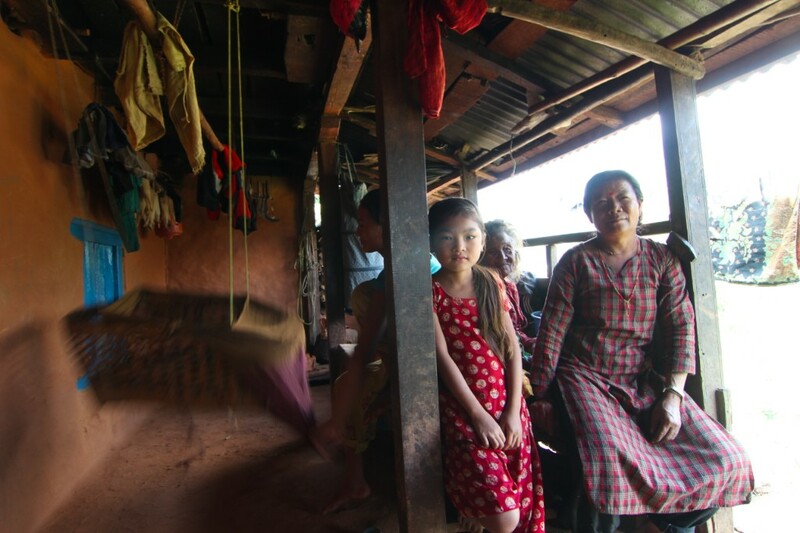 At the time of this photograph, these women knew very very little about the pending hydropower project – despite the fact that the tunnel will go directly beneath their home. Haku is the future site of the headworks(dam) for the 216 MW Upper Trishuli 1 project, being built by a Korean consortium of investors. Currently, the project road is being built up from Mailung, and it is possible it may continue upriver toward Syaphru Besi following project completion, linking to the new Keyrong Road connecting to Tibet. Many others from Haku are hoping the road comes soon and excited for the commercial possibilities, but this man was a bit concerned about the ways their village may change during construction, with so many workers coming in. I made this photograph after spending a wonderful night in this man’s house – like many Nepalis, he was an excellent host. 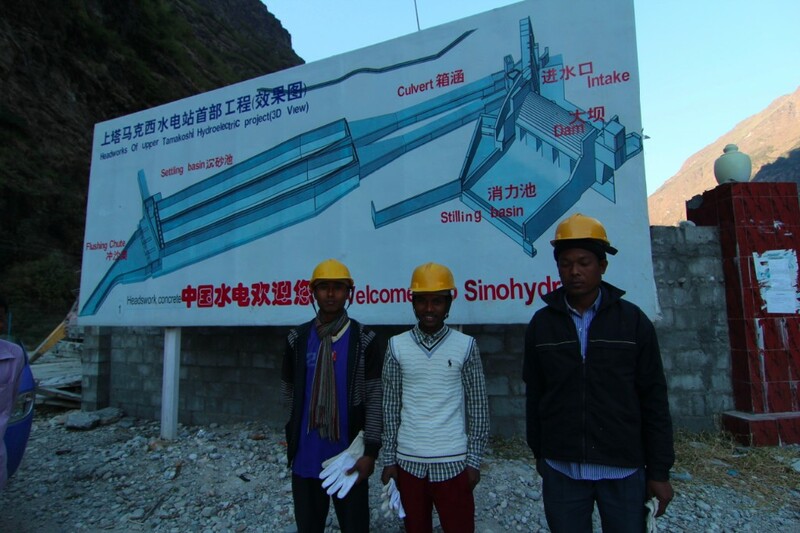 These young men work in a cement production facility operated by SinoHydro, the Chinese contractor building the Upper Tamakoshi Hydropower Project. 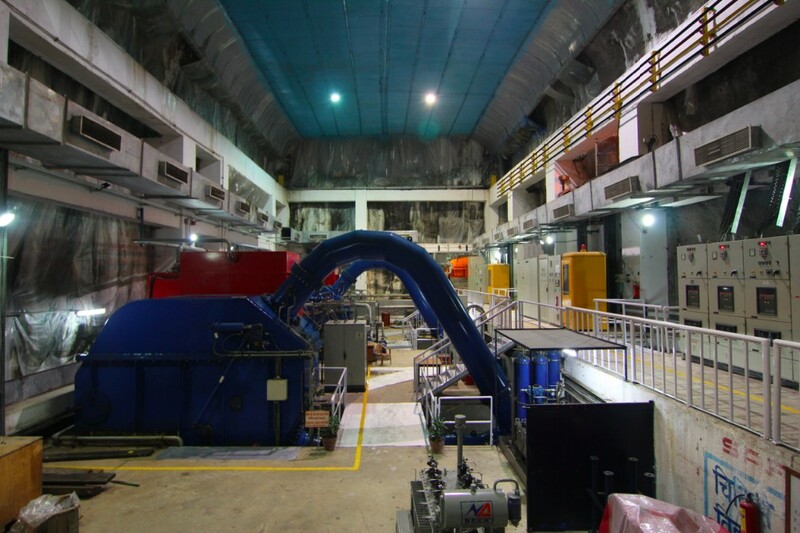 This facility is in Gonggar and serves Bureau 6 of SinoHydro – the division of their organization working on the construction of the subterranean powerhouse and lower tunnel system. Interestingly, this project is big enough that the different divisions of SinoHydro operate somewhat autonomously – many workers said that the divisions manage their workforce differently, that working for some divisions is harder than others. Most of these men are local, coming from households within the watershed, and a few had also worked abroad in Saudi Arabia, Qatar, and Malaysia. This is common – many young people weigh the option of going abroad for work versus trying to find work for the project, coming and going always. Dalits are a low-caste group that have been historically excluded and marginalized, traditionally regarded as ‘untouchable.’ In Nepal, many Dalit households have been implicated in hierarchical relations to land-owning high-caste groups, often living separately, on leased property or in semi-permanent settlements. Due to these patterns of social exclusion and land-tenure issues, the rights and needs of Dalit groups are imperfectly recognized, often overlooked, within the process of hydropower development. 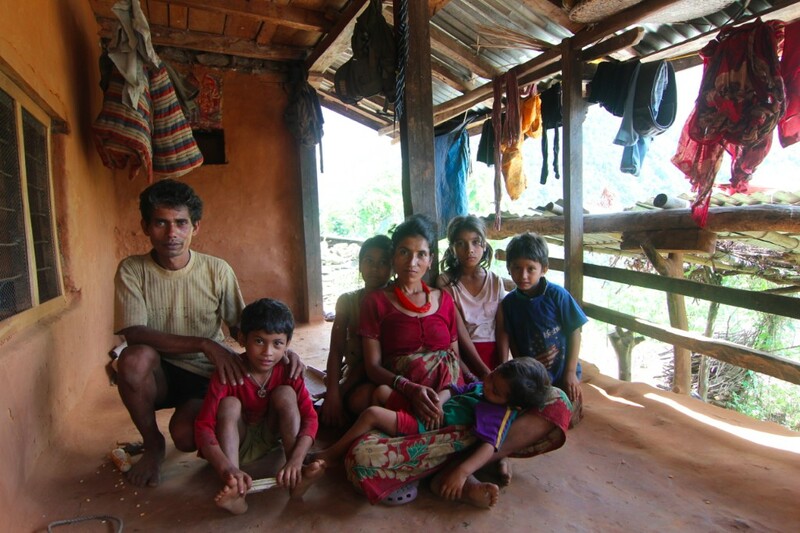 This family lives with a small group of extended family directly above the intake tunnel for the Trishuli 3B Hydropower Project, soon to be built. They expect that their land and perhaps their home will be purchased by the project, and they expect to get good compensation (in this area, compensation and acquisition packages have recently improved). The man on the left has been able to find work with the project (one of only a handful of local men) working inside the tunnel – he says the work is very dangerous, but for him the money is good. 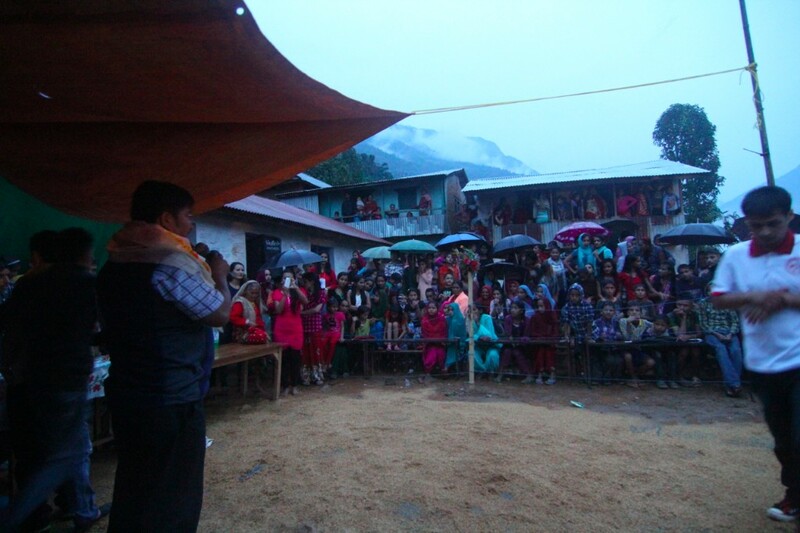 In October, a political candidate in the Constituent Assembly elections campaigns for the Nuwakot-3 constituency, in the village of Archale during a festival gathering. Addressing local concerns about the social failures of the Trishuli 3A Project and the lack of bikas (‘development) in the region, this candidate promised ‘one job for every household in all hydropower projects’ and better trainings for local people to gain skills. He also sought to address local uncertainty and distrust concerning the construction of a tunnel beneath the village for the Trishuli 3B Project, which had recently been boycotted by local stakeholders. Born in a nearby village, within the ‘project-affected-area’ this man invoked shared place, identity, and kinship with the local people (successfully, he won the CA seat in November) pledging to make sure this area gets fair treatment. Before becoming a politician, this man was a successful contractor, so he has a good working knowledge of hydropower development – in fact he is involved in another small project further upstream. During the 2013 elections, promises to equitably deliver local development figured large in the public mind, and several politicians (many hydropower contractors also) made promises to bring hydropower to their constituencies. Hydropower is in politics; politics is in hydropower. ‘Run-of-the-river’ hydropower development proceeds by constructing a network of tunnels throughout Nepal, often linked in a cascading chain of different project systems – the river goes in and out of a series of tunnels, one above another above another. Due to the massive hydraulic head offered by Himalayan river systems, it is possible to put several projects in sequence along any given river or tributary – for example, in the Upper Trishuli watershed there are 14 different projects of this type planned. The ROR design limits the need for the storage of water in reservoirs, limiting the discontinuity in total flows. Yet the flow regime can change appreciably, depending on the portion of river flow diverted into the tunnel, which varies seasonally (consider the monsoon versus the dry season). This tunnel is merely an access tunnel for the Chilime powerhouse and control room, which was constructed underground due to topographic constraints and seismic risk. 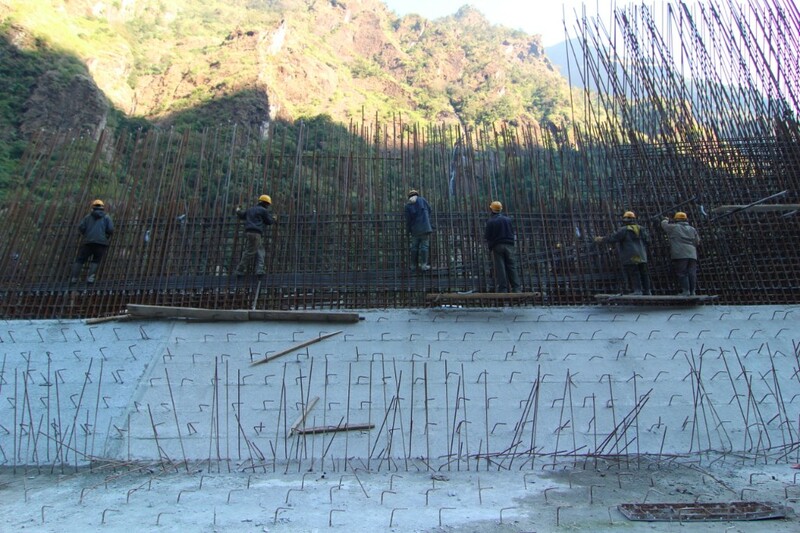 This Chilime Hydropower Project was completed and began commercial generation in 2003. This project is often considered an example of ‘best practices’ in Nepal’s hydropower development, and is sometimes referred to as an ‘indigenous project’ due to the Nepali intellectual and financial capital invested. In 2008, the Chilime Hydropower Company went public on the Nepal stock exchange (NEPSE) offering 10% of shares to local people living in Rasuwa District – a successful method of benefit sharing that is cited as a means to bypass political corruption and local conflict by offering direct equity to individual households. Initially, the project had only allocated 5% of shares to locals, but after a Supreme Court case (undecided, resolved out of court) the company decided to allocate a greater percentage to affected populations. Interestingly, this has proven a winning strategy for stakeholder engagement, as the value delivered to shareholders continues to increase and the company is now pursuing several other projects in the region with local support. This photo of the center of a well-run small/mid-scale hydropower project is thus a unique kind of success story - can this be replicated? This young Chinese engineer has worked for the China Gezhouba Group Company for about a year, living in the company camp and going to and from project sites as needed. 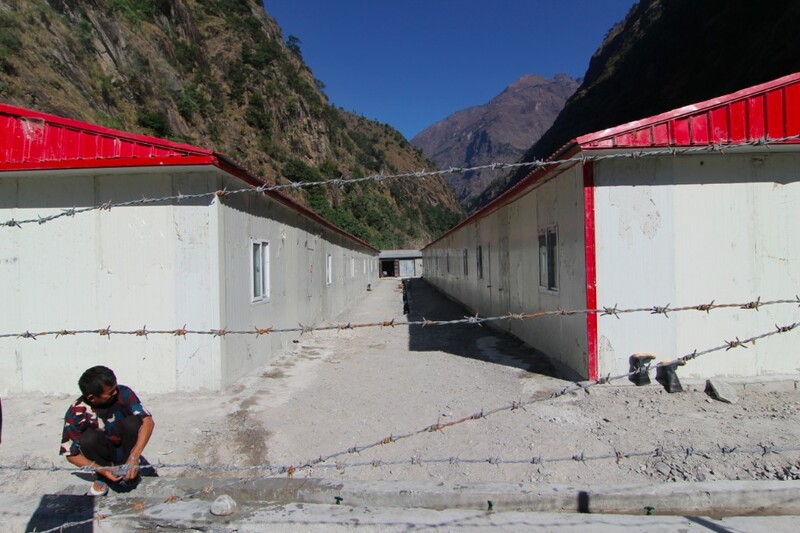 There are usually about 80 engineers and CGGC employees living in this camp, alongside Nepali project laborers, an army barracks, and a temporary housing for project officials. 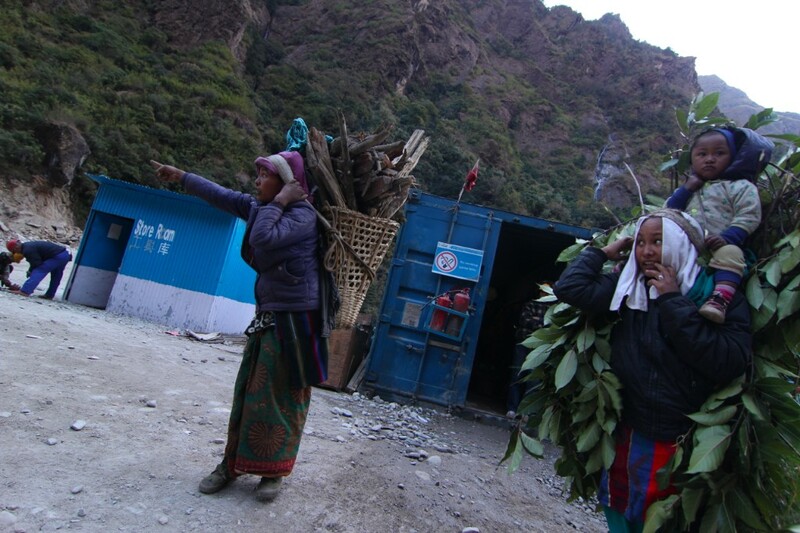 By all local accounts, Chinese workers interact little with the local people excepting petty retail exchange; language barriers make it difficult and the new Keyrong road overland from Tibet now supplies the camp with its own provisions. Most engineers travel back to China once or twice a year; they say the money is good. There are very few women living in the company camps I encountered. 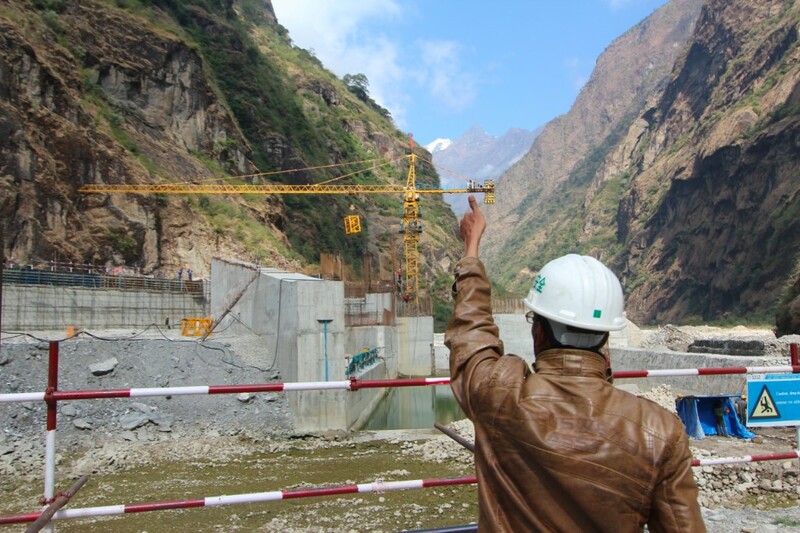 At the time of this photo, construction was stalled due to political tensions surrounding the permitted capacity of the Trishuli 3A Project – the Chinese are seeking to upgrade the project to 90MW from 60MW, but the Nepal Electricity Authority, government officials, and other stakeholders are skeptical that the project can consistently generate this amount. Reported bribes and corruption (on all sides) have complicated the process, as does ongoing political volatility in Kathmandu, and so work was stopped – an expensive proposition. These women are walking back through the headworks site of the Upper Tamakoshi Project after collecting firewood in the area upstream. Neither woman is from the area, but they have moved here to find work near the project – one with her husband who is a laborer, and the other to open a small restaurant that serves laborers. There are roughly 800 laborers living near Lamabagar employed by the project and many more who work in the services industries or as drivers. This level of in-migration to the hydropower frontier can often put pressure on local resources, creating new scarcities, markets, and prices. Importantly, the collection of fuelwood in the shadow of Nepal’s largest hydropower project is important – as the majority of Nepal’s total energy supply still comes from fuelwood sources. The Chief Safety Officer for the UTHKP is employed by the Norwegian consulting firm NorConsult to track the engineering/environmental standards of construction as well as the safety of the working environment – a formidable task. Here at the largest project in Nepal, there are nearly 1500 people employed by the project between the Upper and Lower project sites (in different villages roughly 30 minutes apart by jeep up an intense road that climbs 800m in 14km) so this man and his support staff goes back and forth all day and all night. Working between the client/developer (a joint public-private venture of the Government) and the Chinese contractor SinoHydro, Norconsult signs off on engineering standards, workflow, workplace safety, and timeline for the project. Overall, all parties involved in this project have an impressive record – which is important considering the scale and centrality of this project. Recently, a change in the tunnel design was required due to geologic instability in a given region, delaying the project an estimated one year. This photo was taken at the main headworks site, where the diversion dam for the peaking-reservoir is being constructed; construction here is roughly 50% underway. More recently, the government’s Committee for the Investigation of Abuse of Authority (CIAA) has faulted the contractor for using sub-standard materials – and further investigation is underway. Hydropower development is a complex and uneven process - meanwhile residents of Kathmandu wait eagerly for electricity supply. 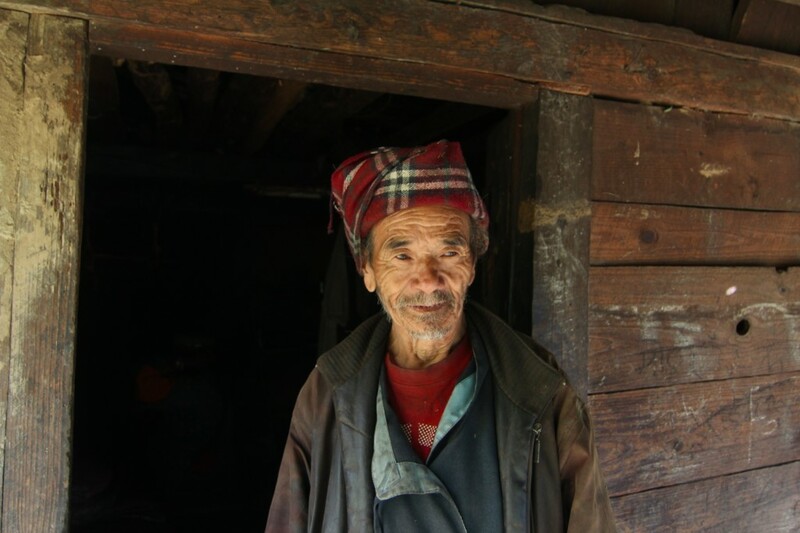 This man has come from Rasuwa, in the Trishuli watershed (my other research area), to work as a laborer for the Upper Tamakoshi Project – a migrant from one ‘project-affected area’ to another. He lives in the labor camp for SinoHydro employees working in the powerhouse tunnel system, and he works nights in the tunnel. Today he is taking a sick day, as he was having respiratory problems and had been told to rest by the community health post worker, so he is doing his washing. He says the money here is pretty good, and that because he can make good money working in the tunnel here at UTHKP he longer has to migrate abroad. His sons, however, are working abroad in furniture factories in Malaysia, but they have debts to pay. This man is a security guard for the China Gezhouba Group Company, working at the upper camp near the headworks site for the Trishuli 3A Project. 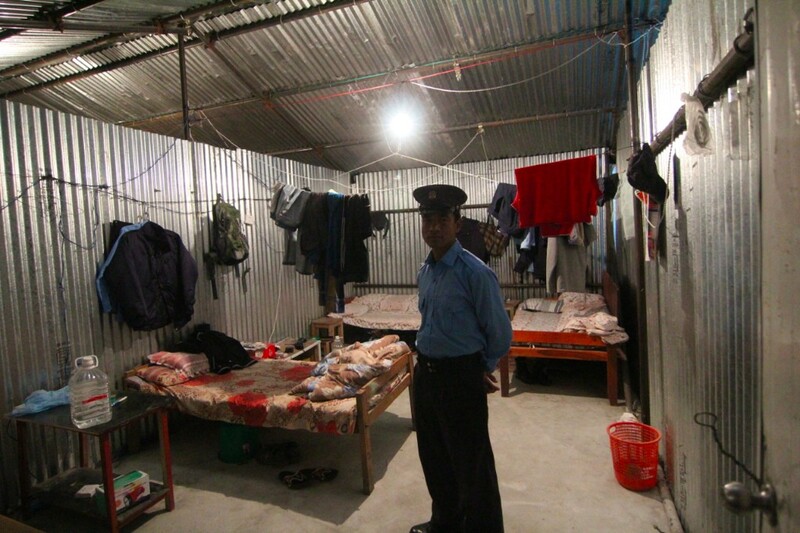 He is from a different district of Nepal or bahira (‘outside’) but has been working here for over 16 months. 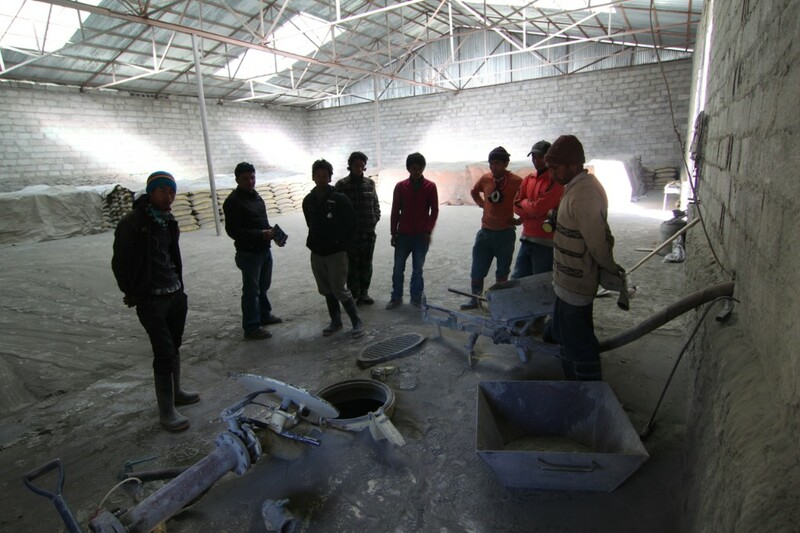 Most of the workers at this project site are from other places, local hiring is very limited here because the wage is poor (about NRS 300 per day, or $3; as compared to other projects that might pay NRS 500 per day) - as many people from other parts of Nepal are willing to work for less. Unemployment and underemployment are incredibly high in Nepal, and thus migration abroad has become an incredibly common livelihood strategy and a powerful force. In 2012, remittances from people working abroad reached nearly USD $5 billion – over 20% of Nepal’s GDP. The classic refrain is that labor migration takes ‘one from every household.’ The majority of workers at hydropower project sites live in temporary housing like this, which resembles the living quarters of laborers elsewhere around the globe. Nepal seeks to become a ‘hydropower nation.’ This is happening in some ways, and not happening in others. The photographs included in this essay were taken during ethnographic fieldwork conducted in the upper watersheds of the Trishuli and Tamakoshi Rivers—where a variety of differently oriented hydropower projects are in different phases of planning and construction. This visual data complements my larger and ongoing research project concerning patterns of social and spatial change in places and spaces affected and implicated by hydropower development in Nepal. By presenting an ethnographic account of Nepal’s hydropower frontier, this work hopes to increase the visibility of the spaces and places where the ‘hydropower future’ is both produced and lived – drawing the eye away from the centralized plans of Kathmandu, and toward the places and spaces of the hydropower resource frontier. In recent years, the production of the hydropower future has been intensifying. As of August 2013 Nepal’s Ministry of Energy reported that 70 of 337 surveyed hydropower projects were at ‘advanced stages of construction,’ representing 1,978MW of power generation capacity This wave of development will triple the existing national installed capacity of 705MW in the coming years – yet still fall short of expected demand, based on trends of population growth, urbanization, and increased consumption. New plans are being made to produce the hydropower future, supported by a complex array of political, financial, social, and environmental mobilizations. Politicians talk about social justice and sovereignty, development organizations talk about scarcity and underdevelopment, the government talks about the welfare of future Nepalese citizens, financiers are actively seeking foreign investment, and the private sector continues to repeat that “Nepal is open for business.” Everyone knows hydropower is needed; everyone knows it is coming; no one knows when or how it is coming. It doesn’t seem to be happening – yet in certain places, the hydropower future is already arriving. Importantly, making a ‘hydropower nation’ requires more than political clout, hydrologic data, cash flow statements, foreign loans, trucks, engineers, and concrete – it also requires the reorientation of livelihoods, political economies, and socialities specific to Nepal. Therefore, my research presents hydropower development in terms of the negotiations, turbulences, adaptations, and intermixtures that mark its fluid boundaries, and from the perspective of differently mobile ‘project-affected persons’ who are engaged in a variety of different future-making projects. 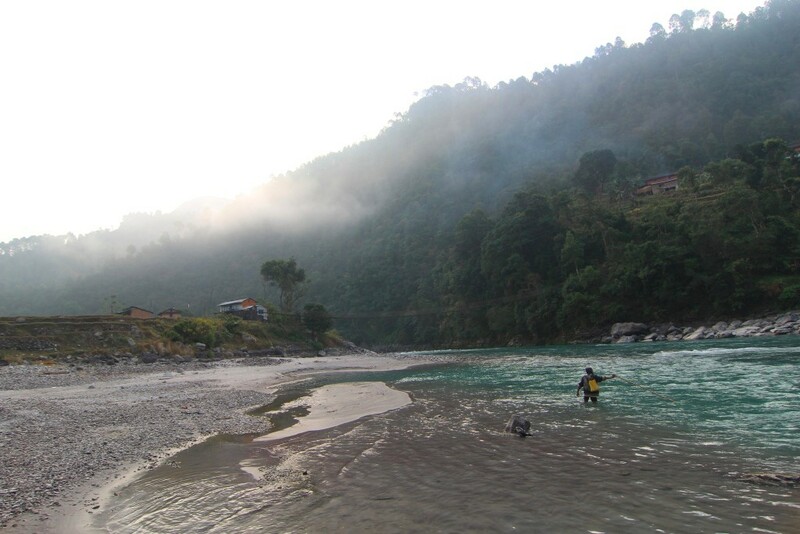 This ethnographic work describes the social dimensions of hydropower development in Nepal – it uses the watershed as the unit of analysis; it proceeds by walking upriver; it reorients itself situationally and relationally as it encounters the questions and concerns of others; it focuses on the unevenness and uncertainty of different kinds of change in ‘developing’ watersheds and the ways that differently people organize meaning within these changes. Thus, I hope to disaggregate abstract definitions of ‘locality’ and ‘affectedness’ by asking the question: What kind of hydropower development, and for whom? My research describes the ways in which hydropower development produces new landscapes of risk and opportunity – simultaneously affecting patterns of empowerment and disempowerment, location and dislocation, connectedness and fragmentation. This study hopes to take ‘local impacts’ seriously while avoiding an essentializing view of ‘localities’ by emphasizing shifting flows and mobilities – tracing how labor, capital, information, artifacts, and imaginaries of hydropower development come and go from watersheds and communities which are oriented differently within multiple spatialities. Each project is a plurality of experiences with shifting boundaries: there is no one hydropower project, and there is no single ‘project-affected area’. Differently situated and differently mobile populations are affected by hydropower development in diverse and divergent ways. ‘Affectedness’ occurs most visibly where people are directly displaced from specific places where culture ‘sits’ – but it also occurs more subtly on mobile people and culture in motion; on cultural flows and mobilities themselves. ‘Affectedness’ itself is a layered and contested concept, shaped by positive and negative effects that are always and everywhere competing. In the upper Trishuli watershed, there are 14 different hydropower projects in different phases of planning and construction, representing 838 MW of power generation capacity. In the upper Tamakoshi watershed there are 10 different hydropower projects pending, representing 1,617 MW of power generation capacity– including the 456 MW Upper Tamakoshi Hydropower Project, which is currently the largest built in Nepal. This volume of development is significant, and these are just two rivers among many in Nepal where hydropower is being developed. Yet despite the palpable imminence of Nepal’s hydro-future, it is important to recognize that hydropower development does not ‘happen’ as per central plans or master narratives—there are theories of hydropower development and there is the muddier praxis. A public hearing for a hydropower project in Pahirebesi, Nuwakot District. In the Trishuli and Tamakoshi watersheds, local responses to the processes of hydropower development are extremely diverse. In some areas people are boycotting public hearings and blockading roads; in other areas they are volunteering labor and purchasing publicly listed shares in the project – in some cases these are the same people. Some Nepalis desire social changes and the prospects for ‘becoming bikasit’ (or developed) that hydropower claims it can bring and others fear them – in many cases these anxieties coexist in the same household. Some people are materially content with the levels of compensation on offer, others are worried that compensation money will be gone in a year and there will be nothing to eat; some people trust their local leaders to negotiate with hydropower developers, others are sure that corrupt local leaders and contractors will ‘eat their money’ and local people will always be poor. Some accept the fact that their houses will be flooded, while others fear their villages will be destroyed by landslides triggered by tunnel blasting. Many people wish information was better; many people pride themselves on their efforts to collect information about the project (which is in some cases, considerable). Many people living athiprabhabhit kshyettramaa, or ‘in the ‘most-affected areas,’ are quite savvy in positioning themselves to solicit compensation, while others have no concept of how to approach the project, and feel powerless. This experience is intensely structured by social difference – by longstanding patterns of social exclusion and relations of inequality that operate along lines of ethnicity, caste, class, and gender. However, despite these inequities and competing values and interests, nearly everyone wants local jobs to put food on the table and roads to make the hardships of mountain life easier. When hydropower projects arrive, things change fast – as the processes of hydropower development introduce new variables into the existing landscape of mobility, producing a complex intermixture of inflows and outflows. There are local people who get jobs for the hydropower contractors and those who do not; there are men and women leaving to seek work in Saudi Arabia or Qatar; there are others returning from years in Malaysia; there are Chinese contractors and laborers living in encampments; developers and machinists from India, and Nepalis from bahira and thala (outside and below) surveying, driving excavators, building roads; British development experts and Korean engineers; there are developers and manpower agents from Kathmandu; hydropower consultants from Norway and financiers from Japan; entrepreneurs from the borderlands of the Tibet seeking increased opportunities for cross-border trade; Australian lawyers, American and Danish researchers, and German development organizations; there are students returning from school in Delhi and NGO workers arriving to build schools; workers from the Tarai hired for the seasonal harvest; there are local community projects financed by Nepali diaspora organizations; trucks bringing new goods overland from China and ‘project-affected people.’ Again, the hydropower project is the site of intersection for many different kinds of social, political, economic, and imaginative projects of future-making. As each project develops and others follow, opportunities and patterns for the deployment, exchange, and replacement of labor become more complex—producing a complex landscape of shifting patterns of work, mobility, access, and aspiration. Flows of labor, capital, and imagination are coming and going always, rushing into the watershed, churning and eddying for a while, then trickling or rushing away. The positive and negative effects of hydropower development are interwoven and interpenetrating – risks and opportunities (or costs and benefits) are co-arising within the new geographies of Nepal, and there are no easy answers here. The material need for hydropower development is a real thing – a lived experience of scarcity with real implications and costs; a polyvalent problem of social justice that rightly warrants attention from projects that assert ‘the will to improve.’ Yet it is also true that development practices are extremely variable and imperfectly applied, that corruption persists, that methodologies for ‘stakeholder engagement’ and ‘benefit sharing’ are still evolving, and that Nepal remains an extremely unequal society – the production and distribution of the hydro-future has everything to do with power. Again and to be clear, it is not my aim to support or oppose Nepal’s various hydro-futures, but to increase the visibility of the lived experience of hydropower. However, I do believe it is important and constructive to question the efficacy, equity, and sustainability of different models of hydropower development—and this necessitates making an effort to understand the social issues and effects of hydropower development in real-time. Photographs can speak volumes that words cannot, and they can speak directly, increasing the voice of those who are not involved in the conversation. Reform and progress has everything to do with vision, with seeing ‘affectedness’ and ‘effects.’ Therefore, this work hopes to equitably shift the politics of seeing—by pulling the eye away from the centralized discourse of Kathmandu and toward the diverse assemblages of experiences, logics, agendas, aspirations, and understandings that exist in the interstices between master plans and ‘big people.’ While the presentation of this material cannot be truly objective, the critiques which emerge in this work are meant to be constructive: to describe the shifting formations and layered changes of the current moment; to support vigilance against abstraction and reduction; to describe what is happening and how it is happening, what is changing and for whom, who and what comes and goes, who benefits and who does not, how and why. Adhikari J. & Hobley, M. (2011) ‘Everyone is leaving, who will sow our fields? : The Effects of Migration from Khotang District to the Gulf and Malaysia’. Kathmandu: Swiss Agency for Development & Cooperation (SDC). Dixit, A., & Gyawali, D. (2010). Nepal’s Constructive Dialogue on Dams and Development. Water Alternatives, 3(2), 106-123. Gidwani, V., & Sivaramakrishnan, K. (2003). Circular migration and the spaces of cultural assertion. Annals of the Association of American Geographers,93(1), 186-213. Gyawali, D., & Dixit, A. (2001). Water and science: hydrological uncertainties, developmental aspirations and uningrained scientific culture. Futures, 33(8), 689-708. Gyawali, D. (2001). Water in Nepal. Republished as ‘Rivers Technology & Society’ (2003). Himal Books.Hirsch, P. (2001). Globalisation, regionalisation and local voices: The Asian Development Bank and rescaled politics of environment in the Mekong region. Singapore Journal of Tropical Geography, 22(3), 237-251. Li, T. M. (2007). The will to improve: Governmentality, development, and the practice of politics. Duke University Press. Pigg, S. L. (1992). Inventing social categories through place: Social representations and development in Nepal. Comparative Studies in Society and History, 34(3), 491-513. Swyngedouw, E. (1999). Modernity and hybridity: nature, regeneracionismo, and the production of the Spanish waterscape, 1890–1930. Annals of the Association of American Geographers, 89(3), 443-465. Austin Lord is a graduate student at the Yale School of Forestry & Environmental Studies, focusing in Political Ecology and Environmental Anthropology with an area concentration in Himalayan Studies. His ongoing research concerns processes of social and spatial change in areas affected by hydropower development in Nepal, with a particular focus on changing livelihoods and shifting patterns of migration and mobility. Austin spent over six months conducting fieldwork within Nepal during 2012 and 2013, focusing specifically on the upper watersheds of the Trishuli and Tamakoshi rivers, and he plans to return to Nepal in 2014-2015 to continue and expand this work. Prior to attending Yale, Austin studied Hydrology at Portland State University and received an A.B. in Economics and Studio Art from Dartmouth College. A broader collection of his photographic work (from Nepal and elsewhere) can be found at www.austinlord.com.